Another Great Year at NTC! Home Uncategorized Another Great Year at NTC! My favorite things to talk about are my son and digital inclusion, so I felt very fortunate last week to present on the latter topic at the Nonprofit Technology Conference (NTC). 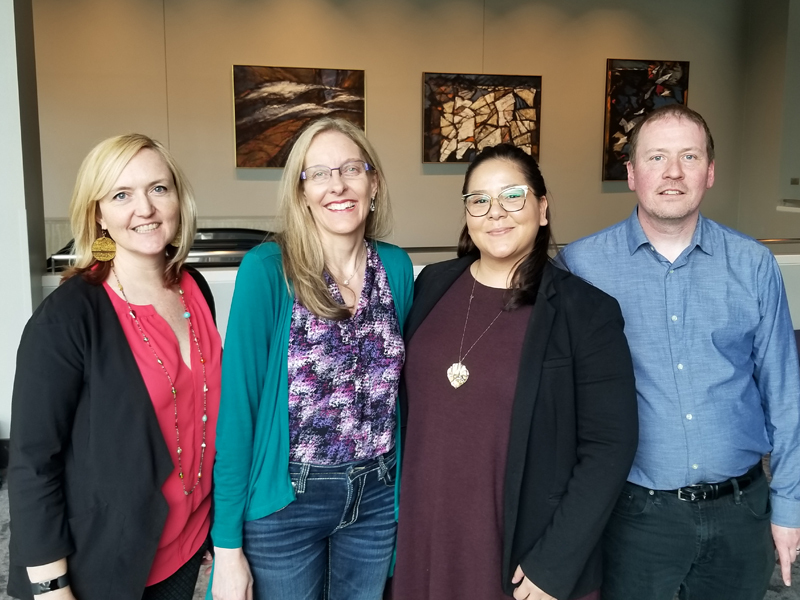 I am pictured here with fellow panelists Amy VanDeVelde from The Oasis Institute, Diana Rodriguez from the Youth Policy Institute, and Brian McGuirk from the Multnomah County Library. Our session was titled “Different Flavors of Digital Inclusion Programming.” The panel had a wide representation of organizations that all integrated digital inclusion into their programs at some point in the last 25 years. They did so because their leadership responded to a clear need in the community, and they’ve been able to find funding through the years to continue. Here are some of the main points that were addressed. Provide access to the internet: Many low-income people can’t afford the ongoing cost of the internet or to keep a device working. When this happens, they need a place they can go that is trusted and in their community. Ideally, there is someone available to answer questions or to offer a regularly scheduled class. This is generally not realistic since nonprofits are stretched thin, and staff members either don’t have the time or don’t have the skill set to offer training. Engaging volunteers can help: Because budgets are tight and staff time is stretched, utilizing volunteers is a great way to meet the training needs of the community. But volunteers need to be managed, which requires a staff person with the time and expertise, which is why they are often not utilized by nonprofits. Don’t go it alone: The issues faced by low-income communities are so great that it really takes a village to make a difference. If you’re seeing an unmet need, don’t jump at addressing it until you’ve looked thoroughly at what is available in your area. There may be a program you can refer people to, or you might learn that there truly is a gap. By learning who is offering what, you can build connections that could lead to partnerships. Free or low-cost tech support is a must: If a computer stops working, many low-income people simply aren’t able to afford to get it fixed. When this happens, it is set aside, and that home goes without access to the internet. Often the problem is minor and has to do with a virus or a needed computer update. Consider partnering with a local computer repair company to offer Tech Help events where people can bring in their computer for free repair or diagnosis. Write digital inclusion into each program budget: Applying for funds to help people improve their employment opportunities? Include a line item for laptops and a trainer to help people improve their digital skills. Each job seeker must have the skills to apply for a job independently and have the confidence to participate in online training if needed. Examples like this can be developed for health literacy, financial literacy, and more. The trifecta of digital inclusion: The internet does no good without a device, and both are useless without digital skills. In order to truly have access, all three must be addressed. Whenever possible, provide your community with low-cost devices, information about low-cost internet, and training in a format that works for their needs. I envision a world where everyone who wants it can have access to the internet. I am hopeful that with great leaders, like the ones on this panel, we will make this happen. It’s quite clear that if you’re not online, you’re excluded. Let’s do what we can to ensure there’s full digital inclusion in our communities!